Background: An ideal strategy for cancer treatment is the specific induction of tumor cell death, sparing normal cells. Marine sponges are rich biological reservoirs of biomolecules, especially lectins, which have attracted considerable attention due to potential biological effect on human cells. Lectins are proteins that bind specific carbohydrate signatures and some gained further interest for their capacity to bind tumor associated carbohydrates antigens and induce tumor cell apoptosis. Objective: This study aimed to evaluate the antitumor potential of H3, a lectin, recently reported from marine sponge Haliclona caerulea on the human breast cancer cell line MCF7. Results: H3 reduced MCF7 cell viability with an IC50 of 100 µg/ml, without a significant effect on normal cells. At 24 h, H3 induced a significant arrest in the G1 cell cycle phase. Consistently, almost 50% of the cells were in early apoptosis and showed remarkable increased expression of caspase-9 (CASP 9). H3 impaired dramatically the adhesiveness of MCF7 cells in culture. Assays conducted with Lysotracker Red probe showed increased organelle acidity, suggesting autophagic cell death, which was further supported by increased expression of microtubuleassociated protein light chain 3 (LC3) and observable conversion of LC3-I in LC3-II by western blot. Conclusion: The apoptotic effect of H3 may be related to a balance between apoptotic and autophagic cell death, mediated by increased expression of CASP 9 and LC3-II. 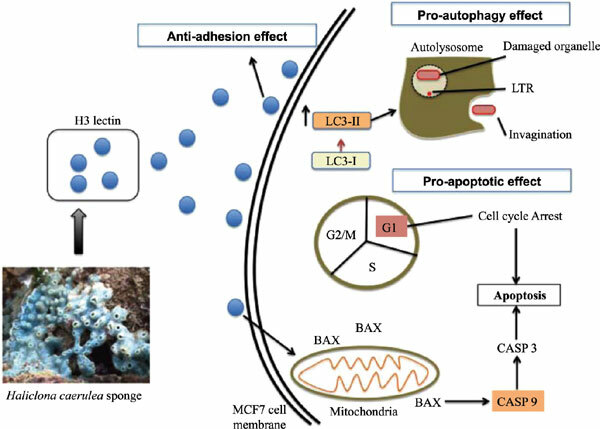 To the best of our knowledge this is the first report about a sponge lectin triggering both apoptosis and autophagy in MCF7 cell. Breast cancer, apoptosis, lectins, marine sponges, Haliclona caerulea, autophagy.